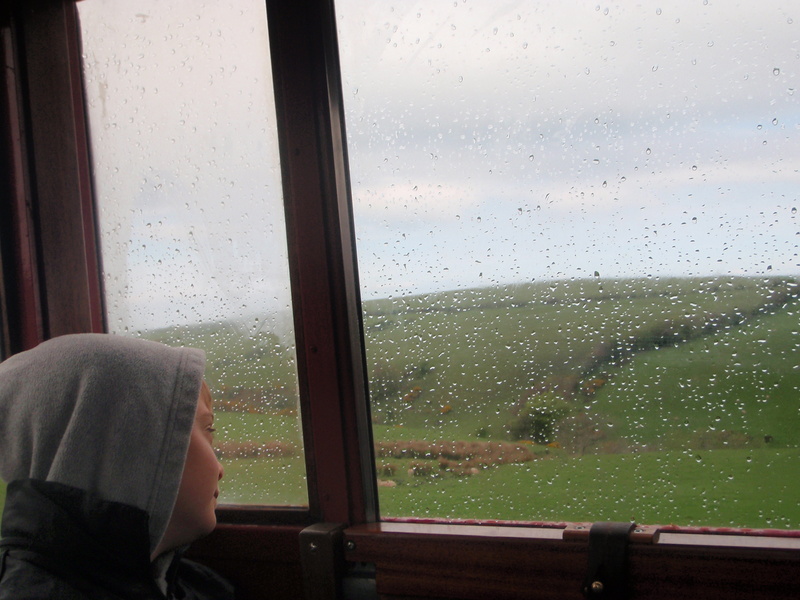 This week’s photo challenge, ‘On the Move’, has made me think of all the time I’ve spent (years, probably, if I added it up) staring through the windows of buses and trains. The photo of my son, taken several years ago while we were on holiday in Devon when he was about eight years old, could just as easily be a photo of me. He’s staring beyond the rain, the hills, the sky, and inhabiting his own world. The unknown place he’s deeply inside is often where I need to be to start writing, or, if not to start, then the place where I’ll discover a missing word or the right line to end a poem. And some of my best writing has taken place in my head while I’ve been glassy-eyed, on the move, between places. I tend to travel by car these days, and although it’s possible to fit in some thinking time when I’m behind the wheel, my mind moves more freely and creatively when someone else is driving. Even if I’ve packed work or reading material for a train journey, my gaze is soon lured away by the streets, fields, hills, sky, rolling past. The world becomes a blur of brown, green, blue, white – classic daydreaming time. There’s something about gazing out of windows while on the move which especially nourishes my creativity. Even though I’m not consciously taking in the details of the scenery, the sense of movement is stimulating and calming – and often rewarding. This photo is a reminder of how much I love those times. In other ways, the photo sums up how I’m feeling right now. I’m on the move and between places in that I’ve had an offer from a small press to publish my first pamphlet of poems – something I’ve been working towards for the last four years – and I’m waiting for feedback after submitting a rough draft of my manuscript. I’m travelling towards publication but there’s always that tension – perhaps this is what makes journeying more stimulating – that I might not arrive. Perhaps tall-lighthouse made a mistake, perhaps they’ll change their minds, perhaps the train will come off the tracks….but then back to the daydreaming and out of another window, there’s fresh scenery to feast my eyes on, new people arriving in the carriage, new ideas for poems, for different writing projects, for another collection…. it’s exciting and frightening at the same time. Just love this ‘moving’ post! All the very best with your submission. Hope it reaches its final destination soon. I always love to look out of the window of a moving train, bus, car, in fact anything. I love to take in what is passing me by as it sets my mind off thinking about possible writing subjects as they pass. However, most of my ideas for writing have been while doing the ironing! I use to hate ironing, but its become my best friend now. The very best of luck with the publication of your poems, Josephine. Thanks for a lovely comment, Hugh! Ironing would make a great post! You could have an array of arty pictures and one of my favourite poems is Vicki Feaver’s ‘Ironing’. Now I would never have dreamt in a million years that anybody would write a poem about Ironing, but I’ve just had a look at the one you mentioned and it’s great. Thanks for mentioning it in your reply Josephine. No problems, Hugh. Vicki Feaver is a wonderful poet – so glad you’ve read some of her work and thanks for letting me know. How’s about ‘Judge Davies does the ironing’ by Diane Syder Hubble? Thanks to the Sansoms for that one.